Azadirachtin is a bio-rational insecticide used as an antifeedant and growth disruption agent against many insect species. However, recent studies have shown that there is a potential risk of this compound harming some beneficial insects. In such cases its application does not normally lead to death, but it may result in altered developmental regulation. Therefore, it is essential to obtain toxicological data to understand the mechanism of such sub-lethal effects, especially where they relate to important beneficial insects. Here, we found that azadirachtin could regulate growth and cocooning in silkworms, which may be associated with induced apoptotic effect on the prothoracic gland. However, azadirachtin treatment could not induce apoptosis in the prothoracic gland in vitro, in contrast to the effect of 20-hydroxyecdysone in vitro, which suggesting that the apoptosis might not be direct effect of azadirachtin. Then we examined the activity of Ca2+-Mg2+-ATPase and found that azadirachtin could trigger a significant increase in intracellular Ca2+ release in the Sf9 cell line, which suggested that the calcium signaling pathway might be involved in the process of apoptosis in prothoracic gland and growth regulation in vivo silkworms. Although more evidence is needed to fully understand the mechanism of azadirachtin in perturbing the growth of silkworms, this study provides some toxicological information and highlights the potential risks of azadirachtin in relation to silkworms. The extensive applications of chemical pesticides could contribute to climate change, toxic residues, pesticide resistance, and a decline in the numbers and habitats of potentially beneficial natural enemies of insect pests. Given these potential adverse effects, increasing efforts have been made to explore the possibilities of developing biocides for crop protection that are based on naturally occurring substances . Plant-derived insecticides, also called botanical insecticides, are widely accepted . Although pest mortality is considered as the most significant evaluation index for pesticides , botanical extracts may cause a variety of sub-lethal effects, such as the impairment of development, reproduction, and behavior, which overall may be very important . Neem-based insecticides containing azadirachtin have played an important role in crop protection . Currently, azadirachtin, a very complex tetranortriterpenoid, has proved to be the most promising plant ingredient for integrated pest management due to its broad-spectrum pest control activity [6, 7]. In addressing the mode of action of azadirachtin, we found that azadirachtin inhibited proliferation and reduced protein synthesis in Sf9 cells (derived from the ovary of Spodoptera frugiperda) . Moreover, during the process of azadirachtin-induced apoptosis, cathepsin acts as a pro-apoptosis element in the lysosomal pathway . Furthermore, the ability of azadirachtin to induce apoptosis in insect cell line has been confirmed by a series of thorough studies [10-12]. As for its effects in vivo, azadirachtin acts as a strong insect growth inhibitor, and has been shown to interfere with the neuroendocrine and alimentary systems in Lutzomyia longipalpis . Qiao et al reported, in Drosophila melanogaster, azadirachtin could interfere with the central nervous system via inhibition of the excitatory cholinergic transmission and partial blocking of the calcium channel in the suboesophageal ganglion region, eventually resulting in an antifeedant effect . Moreover, it could also inhibit egg-laying behavior and affect walking in larvae of Tuta absoluta . However, some of the powerful biological properties of azadirachtin, such as acting as a feeding deterrent and as an insect growth inhibitor, may pose a potential risk to beneficial arthropods, especially the honeybee and silkworm . Studies revealed that 3.2 mg/L azadirachtin could significantly inhibit the egg-laying behavior of bees . Given that such sub-lethal effects are important for development and survival, more information about the potential adverse effects of azadirachtin on economically important beneficial insect is clearly required. In this study, clear development inhibitory effects of azadirachtin against 5th-instar larvae of silkworm were observed, and such inhibitory effects may be caused by apoptosis in the prothoracic gland. However, pure azadirachtin could not induce apoptosis in the prothoracic gland in vitro, in contrast to the effects of 20-hydroxyecdysone in vitro, which suggests that 20-hydroxyecdysone may not be the direct target of azadirachtin in perturbing silkworm larval development. Subsequently, we found that azadirachtin could trigger a significant increase in intracellular Ca2+ release in the Sf9 cell line, which suggested that azadirachtin may exert its action through Ca2+ which affects the process of apoptosis in the prothoracic gland and growth regulation in silkworms. The present study provides information on mechanism of action of azadirachtin in perturbing growth regulation, which may help us to better understand the potential risks of azadirachtin in relation to silkworms. Larvae of silkworm Bombyx mori strain Jiaqiu, were provided by the Research and Development Center of the Sericultural Research Institute of the Academy of Agricultural Science of Guangdong Province. The larvae were reared on fresh mulberry leaves (Morus nigra) at 25-27 °C under a photoperiod of 12 h light and 12 h dark. Sf9 cells were obtained from the College of Life Sciences, Central China Normal University (Wuhan, China) and maintained at 27 °C in 25 cm2 culture flasks (Nest) containing 3 mL of Grace's insect cell culture medium enriched with 10 % FBS (Gibco). The cells were sub-cultured every 3 days. Azadirachtin (95% purity) was purchased from Sigma. For use, it was dissolved in acetone, and then a range of dilutions were prepared, comprising 1.0, 2.5, 5.0, 7.5, 10.0, 15.0, and 20.0 mg/L. Corresponding dilutions of acetone were used as the control. Fifth-instar larvae were used in the experiments, as normally silkworm at this stage are committed for ecdysone release, after which period the prothoracic glands can release ecdysone even in the absence of the brain complex. Before subjecting them to azadirachtin treatment, the silkworms were starved for 5 h. The mulberry leaf discs (d= 4 cm) were dipped in different concentrations of azadirachtin solution, while control discs were dipped in the solvent. The silkworms were then fed the treated leaf discs, and each treatment group had 50 silkworms (female : male=1:1), and each treatment comprised three replicates. After 24, 48, and 72 h, the mortality rate was determined. The experiment was set up as described above. After 4 days of treatment, the azadirachtin treated-leaves were replaced by fresh, untreated mulberry leaves and the silkworms were maintained until they produced cocoons. The eclosion rate and cocooning rate was calculated, respectively. Fifth-instar larvae of silkworms were fed mulberry leaves treated with 2.5 mg/L azadirachtin in dilute acetone. Control silkworms were fed mulberry leaves treated with acetone only. Each of the test and control groups comprised three replicates of 150 silkworms. After 3 days, the prothoracic gland was dissected. Following addition of Ringer's solution, the morphological characteristics of the prothoracic gland were observed using an optical microscopy (Leica, Japan). For observation by transmission electron microscopy, the dissected samples were fixed using glutaraldehyde. After brief washing, the samples were post-fixed in osmic acid for 2 h, and then blocked in 70 % alcohol overnight at 4°C. The samples were then dehydrated using an alcohol series (50%, 80%, 90%, and 100%, v/v) and finally embedded in a mixture of Epon 812 and araldite. They were then stained in alcoholic uranyl acetate and lead citrate and examined under a Zeiss EM-10CA transmission electron microscope at 80 kV. For TUNEL (TdT-mediated dUTP Nick-End Labeling), prothoracic gland samples were treated with 0.3% (v/v) hydrogen peroxide in methanol for 30 min at room temperature. The tissues were then washed three times with phosphate-buffered saline (PBS) and incubated for 30 min with 0.1% (v/v) Triton X-100, in 1% (w/v) sodium citrate. Then, the tissues were treated with 60 μM biotinylated dUTP, 0.2 U/μl of terminal transferase, terminal transferase buffer and 2.5 mM CoCl2 for 60 min. 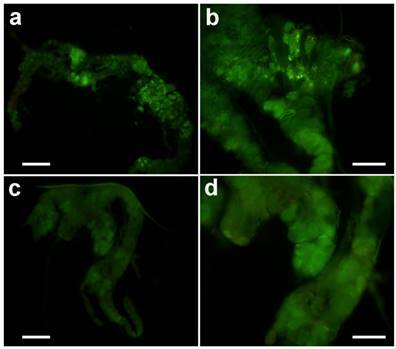 After being washed with PBS, the tissues were observed under a fluorescence microscope (Olympus BX51, Japan), stained with diaminobenzidine (DAB) solution and mounted in Fluoromount-G.
Silkworm prothoracic glands were dissected after treated by 2.5 mg/L azadirachtin for 0 h, 12 h, and 36 h, respectively. The dissected samples were centrifuged at 5000 rpm for 5 min at 4°C. DNA was extracted using a genomic DNA extraction kit (Takara, Japan). The degree of fragmentation was assessed by electrophoresis on 1 % agarose gels containing ethidium bromide. The prothoracic gland was dissected from the 5th instar silkworm larvae. The tissue samples were rinsed by Ringer's solution and cultivated in Grace's solution in an incubator at 25°C under high-humidity conditions. After 4 h of incubation, the medium was replaced with 150 μl of fresh medium, containing azadirachtin or 20-hydroxyecdysone, and then incubation was continued for a further 8 h. For each treatment, five replicates were performed. The TUNEL assays were carried out as previously described. Larvae (5th instar) were treated with azadirachtin as previously described. After 3 d, the prothoracic gland was dissected in PBS. After centrifugation at 6000 rpm and 4℃ for 15 min, the supernatants were rinsed twice with Ringer's solution and stored in PBS at -80°C. The protein content was determined by the method of Bradford using bovine albumin as a standard . Ca2+-Mg2+-ATPase activity was measured by the method described previously . The reaction mixture contained 150 mM NaCl, 5 mM MgCl2, 2.5 mM ATP, 20 μg of homogenate protein, 20 mM imidazole, and 1 mM ouabain. ATPase was then detected using the kit (Jiancheng, Nanjing, China) according to instruction. For the azadirachtin-treated group, 100 μg/ml of azadirachtin was added to the Sf9 cells. Sf9 cells were seeded onto 35-mm round glass coverslips and grown at 37 °C until reaching 80% confluence. Cells were washed in normal PBS, and incubated with 1 μM Fluo-3/AM in PBS for 45 min at room temperature. The coverslips were then transferred to a 2-ml chamber perfused with PBS. Then, the cells were perfused with Dhanks' buffer (Generay Biotech, Shanghai, China) at 37°C at a rate of 1 ml/min. Cells were imaged in Dhanks' buffer using a Laser Scanning Confocal Imaging System (TCS SP2, Leica Microsystems, Germany). The excitation and emission wavelengths were set to 488 nm and 520 nm, respectively. Fluorescence signals were recorded at 600 nm. For each sample, 5 to 10 cells were recorded, and their fluorescence signals before and after treatments were measured. Then, the intracellular Ca2+ values were calculated. The mortality of azadirachtin against 5th-instar larvae of silkworm was examined, and the result showed that the mortality rate was dependent on the concentration of azadirachtin (Table 1). Silkworm mortality reached 100 % at treatment of 15.0 and 20.0 mg/L azadirachtin. Based on the result, the LC50 was 15.05, 8.16, and 4.39 mg/L for 24 h, 48 h, and 72 h, respectively. After 72 h treatment, the mean mortality at treatment of 2.5 mg/L azadirachtin was lower than 30% (Table 1). The silkworms under the treatment of higher concentration of azadirachtin could not produce cocoon, therefore, 2.5 mg/L was used as following experiment. 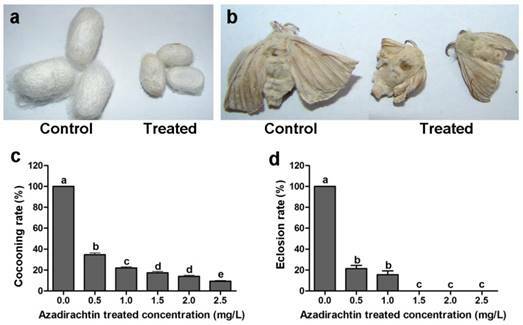 After treatment with 2.5 mg/L azadirachtin, the silkworms could produce cocoons successfully; however, the size was significantly smaller than those of the control (Fig. 1a). Most of the treated silkworms could not complete the process of spinning cocoons and pupation. A few treated silkworms emerged into adults, which also appeared to be smaller and less developed compared with the controls (Fig. 1b). After treatment with 1.5, 2.0, and 2.5 mg/L azadirachtin, the cocooning rates were only 17.33%, 14.00%, and 9.33%, respectively, and at these concentrations, there was no silkworm eclosion, which showed that cocooning and eclosion were significantly influenced by azadirachtin (Fig. 1c & d). Morphological characteristics of silkworms after treated by 2.5 mg/L azadirachtin. a. Fifth instar larvae of silkworms treated by 2.5 mg/L azadirachtin produced smaller cocoon compared with control group. b. The development could be influenced by treatment with 2.5 mg/L azadirachtin on 5th instar larvae. c. The cocooning rate after treated by different concentrations of azadirachtin on 5th instar larvae of silkworms. Every group has 50 silkworms, and repeated for three times. Different letters indicated statistically significant difference when compared with control (DMRT). d. The eclosion rate after treated by different concentrations of azadirachtin on 5th instar larvae. Every group has 50 silkworms, and repeated for three times. Different letters indicated statistically significant difference when compared with control (DMRT). The data represented the mean values±S.E.M of three replicates. Different letter means statistically significant difference in number of laying eggs compared to control group (t-test, p < 0.05). The prothoracic gland of the silkworm is a H-shaped organ consisting of 80-120 round or oval cells surrounded by a transparent vaginal tunica. Tracheae and tracheoles are abundantly distributed throughout the gland. Under the optical microscopy, we observed that the cell size of treated prothoracic glands appeared to be shrunk (Fig. 2a); they were shorter in diameter, in overall length, and at their widest and narrowest parts compared to the control group (Fig. 2b-e). The connections between layers became relatively loose, and sometimes appeared to be dissolved, enabling the trachea to extend into the tissue, and making the color deepen. 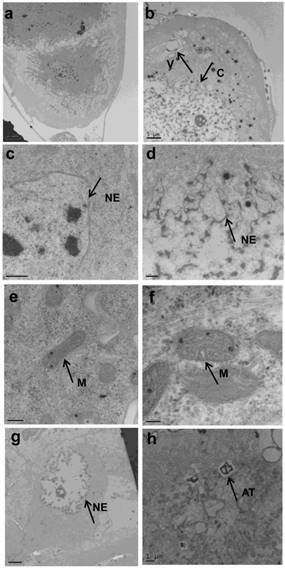 The morphological changes in the prothoracic gland after treatment with 2.5 mg/L azadirachtin were observed by transmission electron microscopy (Fig.3). The treated group and the control group showed obvious differences in subcellular morphology. The tissue structure in the control group was clear and complete (Fig. 3a), whereas, in the treated group, the chromatin was condensed and concentrated at the nuclear membrane with extensive vacuole emerging (Fig.3b). Compared with the control, the nuclear membrane of the treated group was shrunken and the mitochondria were swollen (Fig. 3c-f), as seen in the early stages of apoptosis. And at this stage of the control group, the nucleolus had begun to divide and the nuclear chromatin had begun to aggregate (Fig. 3g). In the treated group, on the other hand, we observed that the cellular components were engulfed by an authophagosome (Fig. 3h), suggesting azadirachtin may induce apoptosis in the prothoracic gland, and that autophagy may also participate in this process. There were no or few TUNEL-positive cells in the control group (Fig.4a), whereas many apoptotic TUNEL-positive cell (green-stained) could be observed in azadirachtin-treated prothoracic gland cells (Fig.4b). These results therefore suggested that azadirachtin induces apoptosis in the prothoracic gland. Fig. 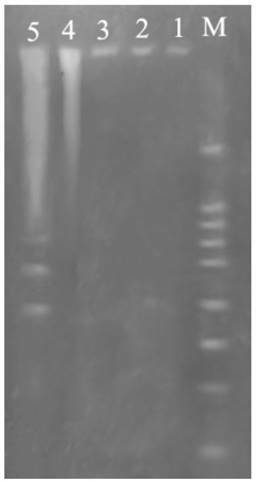 5 showed DNA ladder obtained from DNA extracted from prothoracic gland after treatment with 2.5 mg/L azadirachtin. After 36 h of azadirachtin treatment, DNA fragmentation could be clearly observed. These results further suggested that azadirachtin could induce apoptosis in the prothoracic gland of silkworms. After treatment in vitro with 20-hydroxyecdysone, typical apoptosis could be observed (Fig. 6a & b). However, treatment with azadirachtin could not induce apoptosis (Fig. 6 c&d), which suggests that the apoptosis was not the direct effect from azadirachtin treatment. Morphological characteristics of prothoracic gland of 5th instar larvae of silkworm after treated by 2.5 mg/L azadirachtin observed by optical microscopy. a. The morphological characteristics of prothoracic gland in 5th instar larvae silkworm in control group. b. The morphological characteristics of prothoracic gland in 5th instar larvae of silkworm after treated by 2.5 mg/L azadirachtin. c. The full length of prothoracic gland in control and treated group. d. The diameter of prothoracic gland in control and treated group. e. The length of widest part of prothoracic gland in control and treated group. f. The length of narrowest part of prothoracic gland in control and treated group. Every treated and control group has 50 silkworm, and every group was repeated for 3 times. * indicated statistically significant difference when compared with control (DMRT) (*, P<0.5, **, P<0.01). Morphological changes of prothoracic gland of 5th instar larvae after treated by 2.5 mg/L azadirachtin by transmission electron microscopy. a, c, e, g indicated morphological characteristics in control group; b, d, f, h indicated morphological characteristics in treated group. C: chromatin, V: vacuole, NE: nuclear membrane, M: mitochondria, AT: authophagosome. The bar in a, b, c, d, e, f, g, h represented 5 μm, 5um, 0.5μm, 1μm, 200 nm, 100 nm, 5 μm and 1μm. To evaluate the protein content, the standard curve of the prothoracic gland protein and regression equation was established. Using this result, the protein concentration in treated and control samples was calculated, respectively. The concentration of protein in prothoracic gland of azadirachtin-treated sample (0.55 mg/L) was significantly lower than that in control sample (0.90 mg/L). 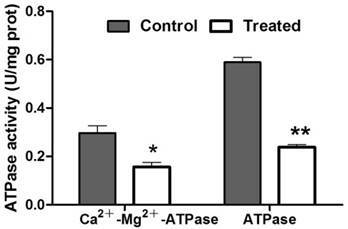 After treatment with azadirachtin, the activities of Ca2+-Mg2+-ATPase and ATPase were reduced by 47.47% and 59.66% compared with the control, respectively (Fig. 7). Sf9 was loaded with fluo-3-AM and imaged using laser scanning confocal microscopy in Dhanks solution. The fluorescence increased significantly after azadirachtin treatment compared with the control (Fig. 8a & b). The average fluorescence intensity in treated cells was 126.620, while it was 89.667 in the control group. 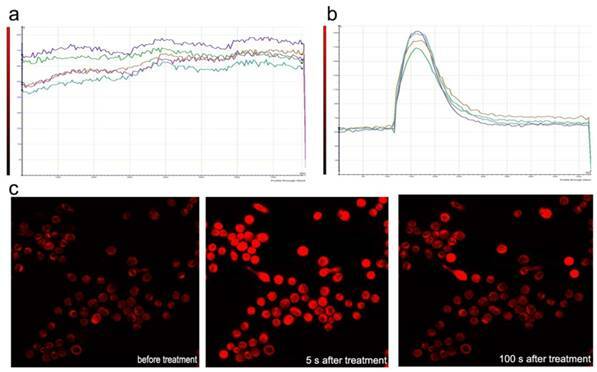 By examining the fluorescence of cells in Dhanks solution, the intensity increased for a short time and then rapidly declined to a steady level (Fig.8c). As there is no calcium in Dhanks solution, these results show that azadirachtin could increase the concentration of Ca2+ via the release of intracellular Ca2+. Azadirachtin is considered to be the most important active principle present in neem . Fifth-instar larvae are committed to ecdysone release , after which period the prothoracic gland may release ecdysone even in the absence of the brain complex . The effect of azadirachtin on the development and cocooning of silkworms was examined on fifth instar larvae of silkworms, and the results showed that azadirachtin could significantly inhibit cocooning behavior and development of silkworms. Complementary to the results in this study, another study suggested that azadirachtin is extremely effective in larval developmental inhibition in silkworm . TUNEL assays. a, The prothoracic gland in control group was dissected and was observed under fluorescence microscopy (Olympus BX51, Japan) by stained with DAB solution and mounted in Fluoromount-G. b, The prothoracic gland in treated group. Agarose gel electrophoretic pattern of prothoracic gland after treated by azadirachtin. Lane M: marker. Lane 1: DNA sample of the prothoracic gland in control group. Lane 2: DNA sample of the prothoracic gland in control group after 36 h. Lane 3: DNA sample of the prothoracic gland after treated by azadirachtin for 0 h. Lane 4: DNA sample of the prothoracic gland after treated by azadirachtin for 12 h. Lane 5: DNA sample of the prothoracic gland after treated by azadirachtin for 36 h.
TUNEL assays of prothoracic gland in vitro. The prothoracic gland after treated by 20-hydrocyecdysone in vitro with 100× magnification (a) and 200× magnification (b). The prothoracic gland after treated by azadirachtin in vitro with 100× magnification (c) and 200× magnification (d). Measurement of enzyme activities. “*” indicated significant difference (P<0.05), “**” indicated significant difference (P<0.01). Growth rate and developmental period must be regulated together in concert to ensure that organs develop to the correct size and proportions . Once insect larvae reach a critical weight, the titer of juvenile hormones declines and is accompanied by the release of prothoracicotropic hormone [22, 23], which causes the prothoracic gland to synthesize the molting hormone, ecdysone . After ecdysone is converted into its active form, 20-hydroxyecdysone, it can terminate larval development and initiate metamorphosis. Thus, the titer of 20-hydrocyecdysone plays a vital role in the development process . Boulahbel et al. reported that azadirachtin could induce the modification of the haemolymph ecdysteroid level to regulate insect growth  . The effect of azadirachtin on 20-hydroxyecdysone was further confirmed by the result that exogenous 20-hydroxyecdysone can compensate for the depressive effects induced by azadirachtin in D. melanogaster . In this study, we also observed typical apoptosis in the prothoracic gland after treatment with azadirachtin on the 5th-instar silkworm larvae, which suggested that the treatment with azadirachtin may induce apoptosis in silkworm. However, in silkworm, azadirachtin has been shown to be unable to influence secretion in the prothoracic gland, and the prothoracic hormone was shown to be unchanged . Such conflicting results suggest that the effects of azadirachtin on the prothoracic gland remain elusive, and it is still unknown whether these effects are direct or indirect. Study showed it is possible that azadirachtin could generate a signal leading to hormone release, which may in turn regulate the haemolymph ecdysteroid level, and eventually regulate insect growth . This hypothesis was confirmed by results that azadirachtin could act on specific cells in the brain, disrupting the release of neurosecretory materials, including prothoracicotropic hormone, and consequently reduce the secretion of ecdysone by the prothoracic glands [7, 20]. In present study, azadirachtin lost efficacy to induce apoptosis in vitro, while, the treatment with 20-hydroxyecdysone alone could induce typical apoptosis in vitro. The results in this study suggested that azadirachtin may interfere with transmitters involved in the regulation of 20-hydroxyecdysone biosynthesis and/or release, and that it does not have a direct effect on apoptosis in prothoracic gland. Moreover, our data suggested that the Ca2+ signal played an important role in azadirachtin-induced toxicity (Fig.8). Consistent with our study, it has been found that the most significantly up-regulated gene in response to azadirachtin exposure was calmodulin by genome-wide expression profiling and RT-qPCR analyses . Calcium is a common second messenger that regulates many processes in cells . In our experiments, insect cells were used because this allows us to measure azadirachtin effects on the calcium channel function in a manner which preserves intracellular modulations of ion channel functions [30, 31]. We found that azadirachtin could induce an increase of intracellular Ca2+ release in Sf9 cell. Consistent with this, it has been demonstrated previously that azadirachtin-mediated intracellular Ca2+ release is the primary event that triggers apoptosis in the Drosophila S2 cell through both the Ca2+-CaM and EcR/Usp signaling cascades . As Ca2+ release could disrupt intracellular Ca2+ equilibrium and could thereby as a death signal when delivered at the wrong time and in the wrong place , azadirachtin-mediated intracellular Ca2+ release may be responsible for the growth disruption by azadirachtin that is observed in a living insect. Botanical insecticides, such as azadirachtin, are biodegradable and they also serve as lead compounds and pharmacological probes to help us better understand biochemical and physiological mechanisms. Azadirachtin-mediated intracellular Ca2+ release may be involved in apoptosis of the prothoracic gland, and thereby leading to growth disruption. The results in this study provide us with insights into the mechanism of action and toxicity of azadirachtin in beneficial insects. Dynamic curves of Ca2+ in the Sf9 treated by azadirachtin. a. The dynamic curves of Ca2+ without any treatment in DHank's solution. b. The dynamic curves of Ca2+ after treated by azadirachtin in DHank's solution. 100 μg/ml of azadirachtin was added. c. The fluorescence intensity of cells after treated by azadirachtin for different time intervals. All the authors have no conflict of interest. This work was supported by the grants from National Natural Science Foundation of China (No. 31572335) and Guangdong Province Natural Science Foundation (2014A030313461), China's Ministry of agriculture, agricultural public welfare industry research (201303017).